DE BRY -The third Dutch artic voyage by W.Barentsz. DE BRY, Th. - The third Dutch artic voyage by W.Barentsz. The third Dutch artic voyage by W.Barentsz. - DE BRY, Th. Title : The third Dutch artic voyage by W.Barentsz..
Map maker : DE BRY, Th.. Size : 5.5 x 7.0 inches. / 14.0 x 17.7 cm. 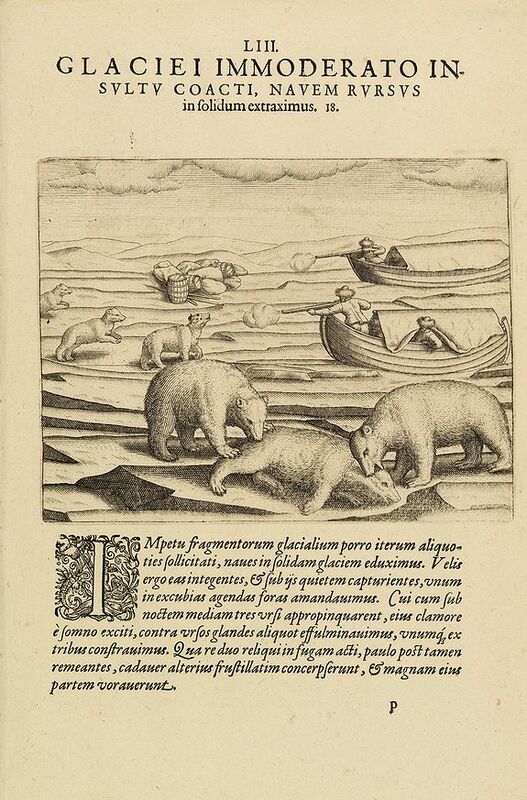 Description :Desirable scene during the third Dutch arctic voyage in order to find the north-east passage to India. Barentsz made three voyages (1594, 1595, 1596-1597) in search of the Northeast Passage to Asia. He reached Novaya Zemlya on the first two expeditions. On the third he accidentally discovered Spitsbergen, rounded the north point of Novaya Zemlya, and was caught in the ice. After the arctic winter the crew started for the mainland in two small boats. Barentsz died on the way. The extent of his explorations and the accuracy of his charts made him one of the most important of all arctic explorers. The meteorological data that Barentsz collected are still consulted today. Despite the failed voyages of 1594 and 1595 Petrus Plancius once more succeeded in convincing Amsterdam of his plans and equipped an Third arctic expedition of two ships. The commands were given to Jan Cornelisz Rijp and Jacob van Heemskerck, while Willem Barentsz was the pilot. This route resulted in the discovery of Bear Island and both the north- westerly and westerly coasts of Spitzbergen. After their return to Bear Island the ships separated. Rijp made one more attempt to go north, while Willem Barentsz sailed to Novaya Zemlya to continue the old route along the west-coast. He managed to round the northern tip of Novaya Zemlya, but soon got caught in the ice, so that the crew were forced to overwinter there. In May/June 1597 they began the return voyage in two open ships. It was then that Willem Barentsz died. Condition : Text sheet with copper plate engraving (140x177mm.) In very good condition, dark impression.